You should be able to add your own IBA's to views.. Wondering why you are not able to see them in the list of available attributes. BTW, from where are you launching this custom View UI ??? Here is the steps I am following. This is strange... Hope you just selected WTPart and not ANY OTHER TYPE and all your attributes are mapped to WTPart level.. I remember the issue if you select more than ONE type then Windchill Search UI does not give option to add custom attributes. 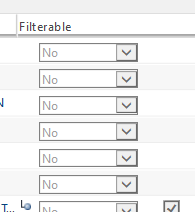 did you validate that your attribute is filterable?